In Three Little Kittens, the sequel to The Cats Wedding, Suki and Barney’s three disobedient offspring learn what can befall children who don’t heed their parents advice. The three little kittens leave their yard on an adventure in mouse catching and discover that while the alleys are overrun with mice they are also home to big, scary, one eyed tomcats ! 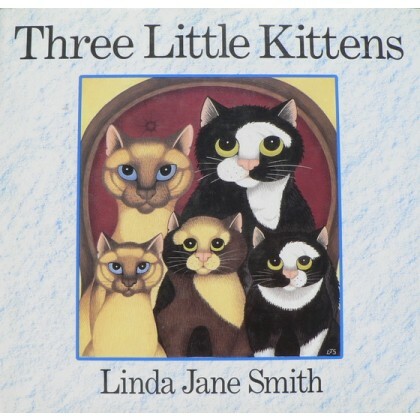 Linda Jane Smith’s beautiful cat prints provide an endearing background for this charming tale of the consequences of childhood mischief. This childrens book with large print and brilliant pictures makes great bedtime reading. This hardbacked book was published in 1990 and has only had light use and is in good condition.